Derwin James was called for an unnecessary roughness penalty for hitting Tyler Lockett with his helmet on a physical tackle. Melvin Ingram had a clean-up sack of Russell Wilson as he left the pocket due to great coverage downfield. Isaac Rochell had a sack of Wilson as he was fleeing the pocket from Uchenna Nwosu, who had beaten Duane Brown outside. Desmond King had a pick-six in the fourth quarter that ultimately put the game out of reach for Wilson & Co. The Chargers ran their offense through their two skilled stars, the first being Keenan Allen. He mostly worked the middle of the field against the Seahawks’ corners and was targeted heavily throughout the game. Allen went for over 100 yards receiving on the day and was Philip Rivers’ most consistent option. 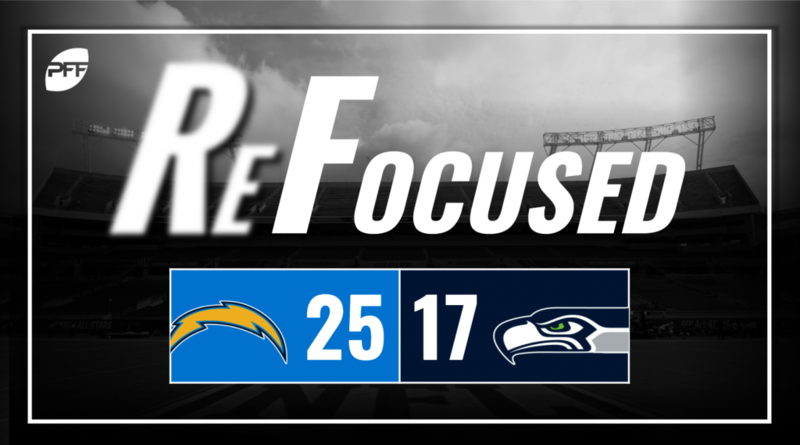 The other offensive key for the Chargers was their star running back Melvin Gordon. He showed good burst at the line of scrimmage and great power at the second level. Gordon was not much of a factor in the passing game but was effective with the ball on the ground, as he rushed for over 100 yards on the day. Wilson received outstanding pass protection on his first-quarter touchdown pass following a lengthy drive that leaned heavily on run plays. He threw a slant route behind his intended target and it hit King squarely in the hands, who fortunately dropped the pass. The Seahawks relied on a conservative, run-heavy game plan that saw several short passes to running backs. Chris Carson was back in action for the Seahawks, but their offense seemed to rely a bit more on a running back by committee to help ease his workload. Rashaad Penny and Mike Davis both saw runs and pass targets. Unfortunately, Carson was limited in the second half. Bobby Wagner, the anchor of the Seahawks’ defense, was once again outstanding. While Wagner was solid in run defense, he especially stood out in pass coverage, where he was constantly contesting passes and ripped the ball right out of Chargers receivers’ hands on a couple of occasions. The Chargers were effective in what is essentially was their bread and butter with the Rivers-to-Allen connection. Wilson’s fourth-quarter pick-six proved costly down the stretch, and David Moore’s drop in the end zone made it even worse.